I did it! 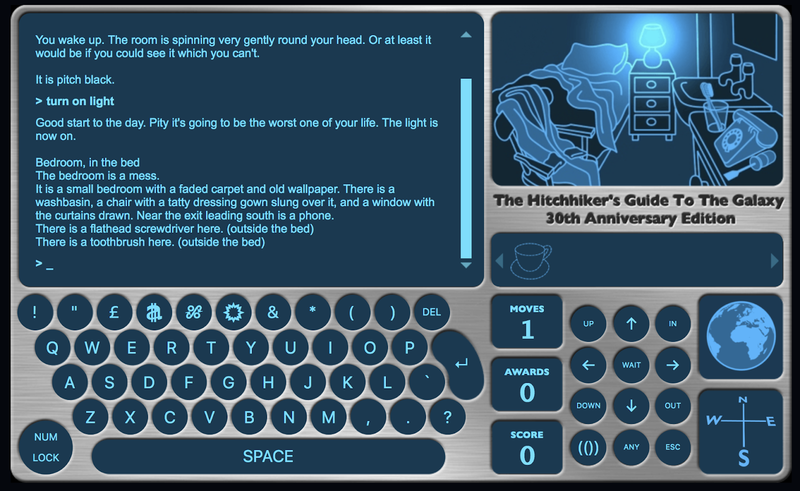 With your help, I conquered The Hitchhiker’s Guide to the Galaxy! This has been my fifteenth Infocom adventure and certainly one of the tougher ones, but thankfully Voltgloss and some Invisiclues were around to put me back on track. I leave this game feeling fairly satisfied, especially as I had made it quite near the end before I needed help. You’ll be reading all about that in just a moment. For this week’s jaunt, I recommend that you get into the mood by a rendition of “Marvin, I Love You”, one of my favorite Hitchhiker’s-related novelty songs. Since this will likely be my last Hitchhiker’s post (unless I do a special one on the canceled sequel down the line), I couldn’t end this without making you listen to it at least once. I’ll have more chances for Douglas Adams love as we later get to Bureaucracy, and (perhaps someday) Starship Titanic. I discovered this tune through Dr. Demento as I doubt the original album was released in the US. The female vocalist on this track is Kimi Wong-O'Brien, better known as the then-wife of Richard O’Brien, the creator of Rocky Horror. 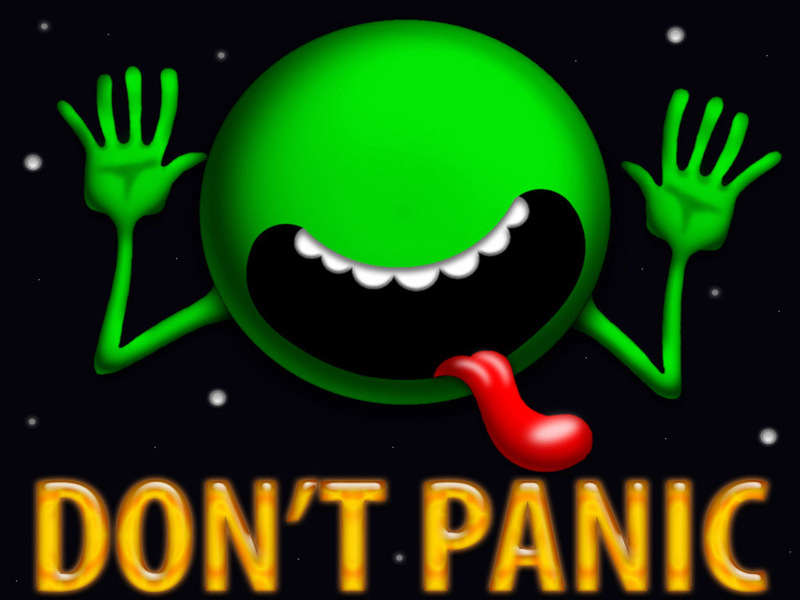 There are more than a handful of Hitchhiker’s Guide-inspired songs released over the years. I’d love it if we got a good playlist of them in the comments! Don’t Panic! It’s time to finally bring this adventure game to a close. Like this, but on a completely different science fiction comedy show. Last week, I gave up. The Improbability Drive had taken me into Ford’s head, as well as Zaphod’s and Trillians’s. It had even taken me in a much more physical way into my own head, as we explored Arthur Dent’s brain Fantastic Voyage-style. Unfortunately, I seem to have found all of the possible mini-adventures that way and still I could not survive the encounter with the nuclear missiles, still could not get a Nutrimat to make tea, and still had no idea what to do with all of the tools I keep finding around. Before I took a hint, I played the whole game over from scratch to find anything I might have missed. (In fact, I just about worked it out, but didn’t connect all of the dots properly.) In the interest of humility, let me spell it all out for you. The missiles always appear when you try to make tea, and the tea won't be ready before they make impact. You need a permanent solution to the missiles problem. So far, whenever you've used the spare Improbability Drive, it's only affected *you*. You need a way to make its field affect something much larger - like the missiles or the Heart of Gold. Reread your description of the spare Drive from back when you found it. You asked a question then that you couldn't answer. It's time to find that answer. Specifically: "But what does the long cord connect to?" Also keep in mind another, more simple attribute of the Drive that you may not have used yet. ...looking for a place where the long cord can connect. Where's a logical place to connect something to affect the entire ship? In short, there was an extra receptacle in the ship’s bridge that I failed to find. I did notice there was an extra plug that didn’t go anywhere, but then I promptly put it out of my head. By dragging the portable generator to the bridge and re-attaching the wires to the Advanced Tea Substitute, I could plug it in. Eddie didn’t like that at all: the receptacle was the manual override and I am repeatedly reminded that it is for Emergency Use Only. I try activating the drive and the whole system shorts out, but not before a bunch of senators on an alien world are brutally killed by my incompetence. I restore. Next time around, I find a real “Emergency” to use the drive during: I ask the Nutrimat for tea. That triggers the same events as before where it consumes all of the ship’s processing power and memory just as we arrive at Magrathea and get attacked by nuclear missiles. That sounds like an emergency! I use the device and it turns the missiles into a sperm whale and a bowl of petunias, just as in the book. With the coast now clear, Eddie begins the landing process and Zaphod even comes out of the sauna to tell me that I’ve done a good job. Even better: I HAVE TEA! The Nutrimat successfully created tea while all of this was going on, so it’s a bonus. When I pick up the tea, I automatically drop my “no tea”. Since my common sense is gone (see last post), I can now also pick up the “no tea” to have them both at the same time. I vaguely remember this puzzle from when I was a kid. Score again! Who ever decided it was okay to put milk in tea? With the impossible combination, I return to the screening door and successfully demonstrate my intelligence: because I can have two contradictory thoughts at once (“tea” and “no tea”), I must be a brilliant philosopher. It lets me in and I die immediately as wave after wave of concentrated depression strike. I restore back. It’s like Marvin, magnified! Speaking of which, the robot is nowhere to be found now. While I am exploring, Eddie chimes in to tell us that we’ve landed but that he needs 14 years to make sure it is safe outside. He’s helpfully sealed the hatch to ensure we cannot leave until he is sure. There is nothing new (that I can find) in the Improbability Drive. Everywhere I go just leads me immediately to my death. Using the “tea” as the Brownian motion generator instead of the “Advanced Tea Substitute” works, but it doesn’t appear to change anything or offer any new places to visit. I can access the hatch’s maintenance area just like before, but I am told that the controls are far too complicated for my feeble brain to handle. I’ll need some help if I want to leave. I also try more guide entries, but I don’t find any on depression or how to survive it. 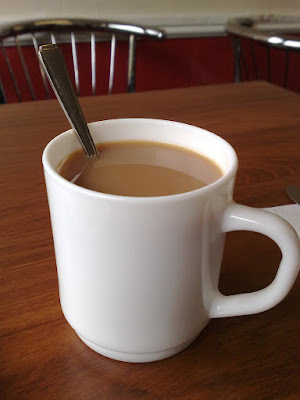 The solution I find ends up being right in front of me: I drink the tea! Drinking tea makes Arthur very happy and that extra shot of joy overpowers the waves of depression emanating from the doorway. Once inside, I find Marvin (that is where he is hiding!) and a chisel. I can ask him to open the hatch for me and he agrees, telling me that he’ll meet me there in twelve turns. I will have to bring the right tool with me. How hard could that be? Answer: Very. You can only take one tool with you to the access conduit because of a tight squeeze. You cannot drop any objects in there because the mesh catwalk ensures that you lose anything you drop to the bowels of the ship. He doesn’t seem to want any tools that I bring and even cheating by saving and reloading doesn’t help because he just asks for something else. For example, he wanted a hyperwave pincer the first time and a chisel on my second attempt. How can I know what to bring him? Like this, but the whale is plummeting to his doom. When I used the real tea in the Improbability Drive, there was a difference that I didn’t notice. With that in place, you have a limited ability to control where you end up from Dark. With the Substitute, each time you went to Dark you would end up in a different random location. It didn’t matter whether it took you one turn or twenty to figure out the missing sense and get out of there, you’d always go to the same randomly selected place. With the tea, every turn changes the destination of the room. Since I was good at solving the sense puzzle right away, I never even got to notice this. With that advantage, now we can sort-of map the whole thing. I was supposed to notice that each sense could lead to one of two locations. The “smell”, for example, could be either Ford waving the mineral water under your nose leading to the Vogon ship or the Bugblatter Beast of Traal’s tail flicking in your face. From there, we might notice that there was only one option for “feel” which takes you to Trillian’s party sequence. But with the tea in place, there is now a second “feel” exit. I might have stumbled on this by random chance, but it would have taken a while. That exit takes me to the inside of a whale! Not just any whale: the whale that was until very recently plummeting to its doom over Magrathea. Like this, but… you get the idea. 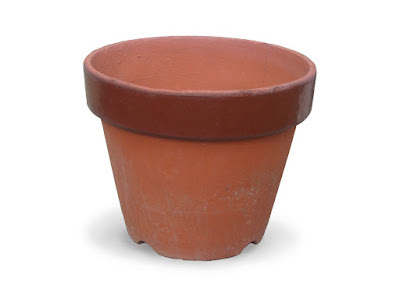 I’m not alone in the whale: there is a also a flower pot filled with soil. How did it get there? Why is it there? I have no idea, but it doesn’t beat too much consideration considering that the whale was a nuclear missile just a few minutes ago. These things aren’t expected to make sense. I wait around to see what happens and die in a few turns. I restore back, but I have a theory: this involves all of the “fluff” that I’ve been finding since the beginning of the game. The guide helpfully tells me about a legend that there are four pieces of space fluff and they are part of a seedling to a tree of “amazing properties”. I put all four pieces in the pot and… nothing happens. Only in the final moment before the whale crashes does a tint sprout begin to appear. I have the right idea, but I need to get it out of the whale so that it has time to grow. Once the whale dies and I am back on the ship, the pot is nowhere to be seen. The solution is obvious: I use the “thing your aunt gave you”. It always reappears no matter what you do and it is a container. It clearly was designed for this puzzle. I re-do the whale puzzle and this time put the flower pot in the “thing” before crashing. Once I recover from “Dark” and am back in the Heart of Gold, the thing reappears with the pot inside. Yay! The next problem is making the seedling grow faster. I try spending a lot of time in the sauna, but that doesn’t help. It’s only when I take the pot in the sauna with me that the tree grows up and produces a fruit. I eat the fruit (what else would you try first?) and am given a vision of the future where Marvin needs a set of hypersonic pliers. With that predestination firmly in hand, I re-do the sequence with Marvin and bring the correct tool with me. He is able to open the hatch and we win! We have arrived arrive at Magrathea with the promise of a sequel being available soon. I am still waiting. Better than the 1981 game’s ending, but just barely. The final “tool” puzzle is evil. 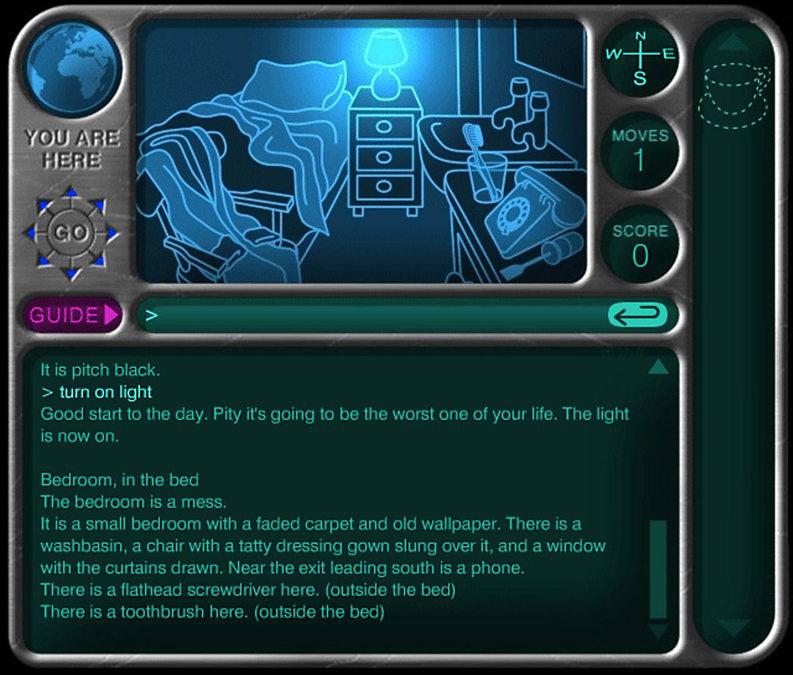 All of the random tools that you pick up in the game could be the one that Marvin needs, including the screwdriver and toothbrush that you find in the very first room of the game. While the selection of the tool that Marvin will require is random, it will always pick a tool that you missed picking up. This makes every tool in the game a required object and means that a failure to pick up everything not nailed down in the very first room will render the game unwinnable. 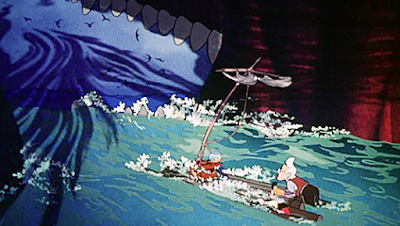 The “inside of whale” sequence is also more evil than I realized, although I was lucky when I solved it. When the whale crashes into the ground and you get returned to “Dark”, you lose everything you are carrying permanently. The only things that remain are what get put into the “thing your aunt gave you”. I solved this puzzle by stashing the flowerpot in there, which is a good solution, but everything else I was carrying was lost forever including my Guide and signaling device. I didn’t notice while playing the game, but if I had been carrying any tools with me, the game would have been unwinnable. 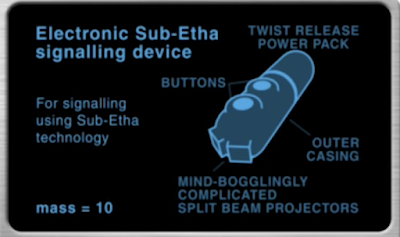 The “correct” solution to the “inside of whale” puzzle is to use the signaling device. The Heart of Gold, as we could have remembered, is right outside and could pick us up. (I’m not sure I buy this logic. The Vogons picked us up in the beginning of the game using the “thumb”, not the Heart of Gold. Are we to assume Eddie would pick up the signal and act on?) There’s a bit where the device is broken, so you push the red button to “call engineer” and then show them the warranty to get them to fix it, all in time for you to leave. Yeah, I like my solution more. Supposedly, you can bypass the “inside of whale” puzzle entirely by putting every tool in the “thing your aunt gave you” and taking that to Marvin. I didn’t try this. I’m glad there are multiple solutions in this game, but the tool puzzle seems even less fair now that I understand it. These things are quite expensive on the secondary market. Alas, it will not be joining my hint book collection. But the included maps are quite nice! 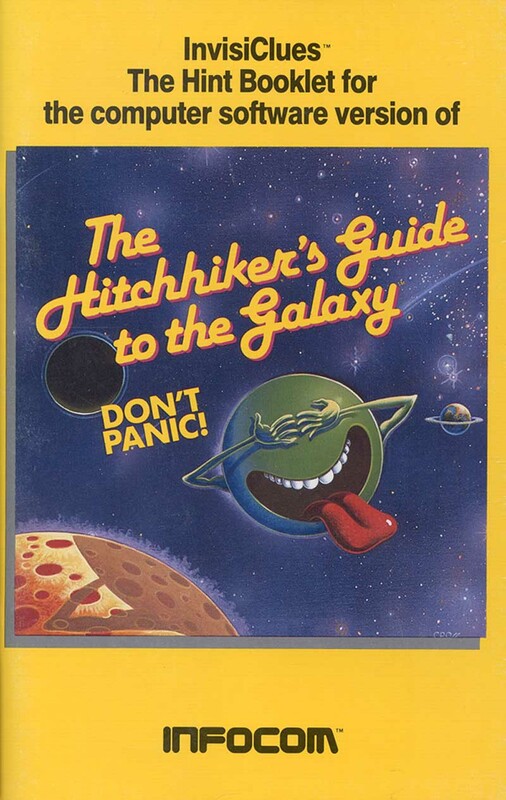 Needless to say, Hitchhiker’s Guide was a fantastic success for Infocom. With over 300,000 copies sold, it was the second-largest release for the company behind Zork I. Mr. Adams was contracted for five sequels, of which none were made unless you count Bureaucracy. The story of the lost sequel to Hitchhiker’s Guide is something of a legend and I hope we’ll be able to discuss it in more detail in a few months. I have managed to get my hands on two of the early game prototypes, although very little in the way of game content was ever created. This will not be like the fourth Questprobe game where I was able to play a 50% completed game with some of the puzzles intact, but I hope I’ll be able to shed some light on the story and design notes. We’ll see. My plan is to tackle that challenge fully after Bureaucracy, eleven games from now. Although not proper sequels, the BBC released two follow-ups to the game: the 20th and 30th Anniversary editions. The twentieth anniversary edition, released in 2004, was a web-port of the game based on Adobe Flash. It’s still available on the BBC web site, but I could not get it to play in any modern browser and had to resort to stealing a screenshot that I found online. This edition features two different sets of illustrations, cobbled together from an artistic competition that had been held prior to its release. Art for the first edition was produced by Rob Lord and Nolan Worthington, both industry professionals. Rob had been the animator on the original Hitchhiker’s Guide television series, as well as Max Headroom. Nolan was a game artist who is best known for his work for Traveller's Tales, as a designer for many of the Lego series of action-adventure games. The second edition of the game used amateur art provided by Andrew Wyld and six other contest-winning artists. The thirtieth anniversary edition was released in March of 2014. It once again featured the art of Rob Lord in a new HTML5 interface with some basic sound effects added. This game works just fine in modern browsers and I played it up through the Vogons just to get a feel for it. It supposedly can be hooked up to Twitter and tweet things at the world while you are playing, but exactly why you would want to do this is unclear. I did not quite have the energy to play it all the way through although I am curious how (if at all) they handled the sequel-hook in the ending. Anyone want to spend a few hours on it? Puzzles and Solvability - This is a difficult game. I don’t mean that just because I couldn’t solve it-- there have been plenty of Infocom games that I needed help with-- but because I’m not sure that I could have solved it. The tool puzzle seems quite unfair in general, mapping the “Dark” was completely lost on me, and I apparently solved the “in the whale” puzzle in entirely the wrong way. That said, the babelfish puzzle was fantastic. For all the complaints that a generation of gamers made about this puzzle, it is undoubtedly one of my favorite Infocom puzzles so far. I also enjoyed in retrospect that some of the puzzles had multiple solutions and that I wasn’t penalized on points for using an alternate method to get what I needed out of the whale. The way that this game managed to both be humorous and have enough internal consistency to make the puzzles work says something about the craftsmanship that went into it. My score: 6. Interface and Inventory - What can I add to what I have said about the Infocom parser before? Plenty. 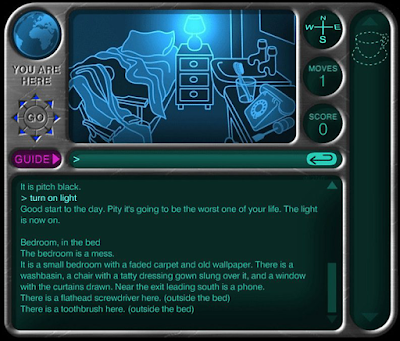 This is a game that knows it is a text adventure and takes the conventions of the genre and throws them out. From the “footnote” command, to the game needing help to find the word “idiot” in one sequence (did I even mention that? ), to all of the other little flourishes, this is a game that thrives in the textual medium. I doubt it could ever be ported to anything else without losing much of its heart. 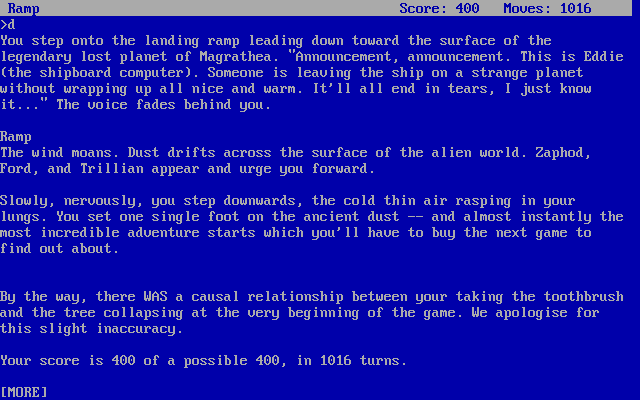 This is the first game where I am positive I am playing “Interactive Fiction” instead of a “text adventure”. My score: 5. Story and Setting - This is a great work by a master storyteller, and yet… this is the part where I have to be honest… does anything really happen in this game? The prose is masterful, but it goes absolutely nowhere. 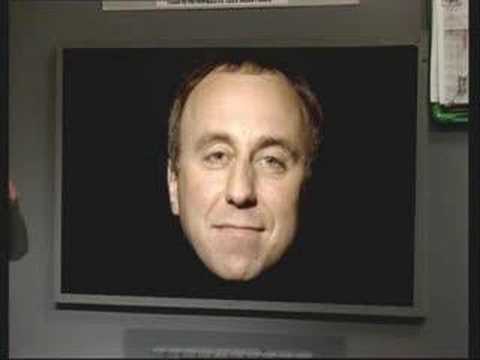 There is no climax, just a solution to one more puzzle and we’re off onto a planet that Arthur doesn’t really have any desire to go to. We don’t need deep character development, but even after going into the heads of our four principal characters, we don’t learn much. This is a very fun ride, but the story botched the landing (literally) and I feel less positive than I expected. My score: 5. The Anniversary Edition’s illustrations made it easier to understand certain objects. Sound and Graphics - This is the always-unfair-to-Infocom category (at least for a few more games), and as usual we cannot give above a zero. The blue background was probably not added until the 1987 re-release and even then we never got the Hooloovoo joke that would have made it a part of the game. The anniversary editions would have scored at least three here for their multiple art choices, detailed depictions of every major object in the game, and basic sound effects. My score: 0. Environment and Atmosphere - This is a fun experience. 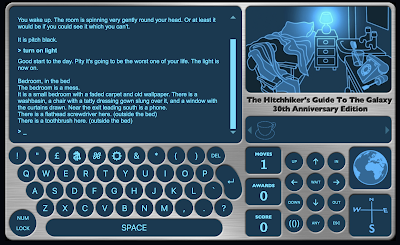 The game is a master class on how you make an engaging narrator in a text adventure. I genuinely wanted to explore each segment of the game completely just to see what sort of off-the-wall banter we discover. The difficulty of the game detracted from the final presentation; dying may be humorous the first dozen times, but it gets old quickly when you are frustrated. I’ve harped enough on the no-climax ending, but the ride was well worth the trip anyway. My score: 7. Dialog and Acting - This is the best written game that I have ever played. There is genuine humor here, the kind that tickled my funny bone as a kid and which I appreciate in different ways today. I spent hours smiling while playing this game. The game is not without its faults, especially in how it treats the main quartet: they are even flatter here than in the books! There is less here than it seems, but what is here is on a different level. My score: 7. Using my discretion points, I am going to subtract one. The requirement that you pick up every tool since the beginning of the game in order to win, even though “in universe” you only needed one is annoying. Add that to the lack of real ending or good feeling once you solved it? It’s not great. I hate that the game ended with a bad taste in my mouth. That makes the score (6+5+5+0+7+7)/.6 - 1 = 49! With that, Hitchhiker’s Guide sails to the top spot among all of the Infocom games I played, although one point below Ilmari’s playthrough of The Witness. I didn’t like that game as much as he did. Such a high-score is deserved, but it’s also frustrating: a better ending or tweaked puzzles could have propelled the game to a different level. I admit that I expected Planetfall to score higher, but reading these scores I am comfortable with this ranking. What do you think? You guys utterly nailed the score with an average guess of just over 48. Go everyone! Michael is the lucky one with the spot-on guess, and he was the first guesser as well. As far as bets go, the consensus seems to be that I would have failed to solve the Babelfish or “no tea” puzzle. Sorry to disappoint! Biscuit did guess that I would fail to get the hatch open. Given how interconnected the final puzzles are, I will have to call that at least a partial “win”. Michael’s CAPs, as well as all of the “bet” and contribution CAPs, will be distributed with the next mainline game. First, I’m going to finish Suspect and make a post about it on my personal blog. It’ll be in the left sidebar, but I’ll also link to it in the next post after it is ready. My goal is to play every Infocom game, even if I cannot write about it here. 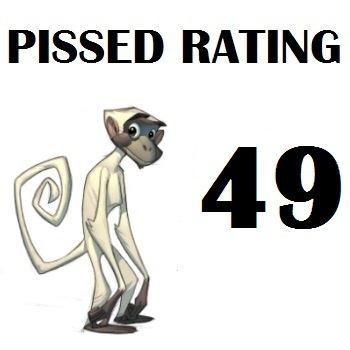 You should check out Ilmari’s excellent review which has our official PISSED rating. After that, I’ll have a 1984 wrap-up post to cover the final original Zork book (Conquest at Quendor) and all of the new Zork manuals that came out with the greybox editions of the game. I know that a lot of fans have fond memories of Zork manuals and feelies, and many of them originated in these re-releases. I do not know what I am going to do about Cornerstone yet. It’s not a game and so it doesn’t warrant much time here, but it is the product that sunk Infocom at its peak and so I’d like to toy with it and see if I can get it to work. What do you think I should do? Finally (finally! ), I’ll start the playthrough of Wishbringer. This is an unofficial Zork game and one that I have never so much as touched, so I am looking forward to it. While I didn’t quite get a weekly pace with the bonus material, I have recently completed a review of Doctor Who and the Krikkitmen, a posthumous collaboration between Douglas Adams and James Goss based on a 33-page script treatment that Adams wrote that was rejected. 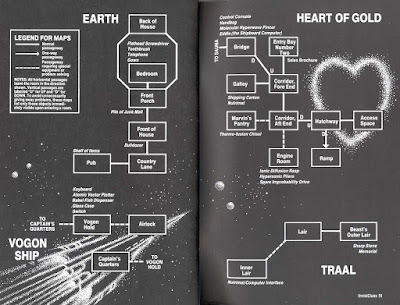 Fans of Douglas Adams will recognize the overarching plot as being the same as the third Hitchhiker’s book, but elements of this treatment were reused in Shada and “The Private Life of Genghis Khan”, and possibly elsewhere. Mr. Adams was never one to let a good idea go unused. James Goss transposed the story slightly, placing it with Romana as the companion instead of Sarah Jane Smith, and it makes a great capstone on his trilogy of Adams-created Doctor Who stories. With luck, expect the next marathon post here within two weeks. See you soon! 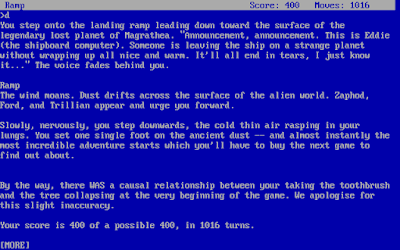 The AGT graphical fan remake is well worth covering, which would be a compare-and-contrast grand slam if done by the same person who had just played the text adventure. Are you referring to "Space Aliens Laughed at My Cardigan" (1994) or something else? I wouldn't mind looking at that in a few years. I already plan on looking at "Pork" as a wrap-up to our little marathon. - The clue to getting past Marvin's door - i.e., how you're supposed to know you need simultaneous "tea" and "no tea" - is in the Guide. The door complains you're not "intelligent" enough if you try to enter it, and if you consult the Guide about "intelligence," it explains thusly: "Intelligence is the ability to reconcile totally contradictory situations without going completely bonkers -- for example, having a stomach ache and not having a stomach ache at the same time, holding a hole without the doughnut, having good luck and bad luck simultaneously, or seeing a real estate agent waive his fee." - The game goes meta with drinking the tea to survive Marvin's room. Drinking the tea earns you 100 points - a quarter of the points available in the entire game (the next highest-scoring actions only give you 25 points). When you enter Marvin's room after drinking the tea, the game tells you that you survive the waves of depression, not only because how good that tea was, but also because you're so pleased about having such a high score. Also, I played through the 30th anniversary edition and the ending - indeed, all of the game's text content - is the same as the original game. Unfulfilled sequel hook and all. 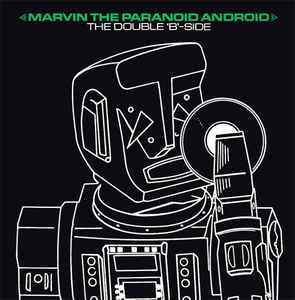 “Marvin, I Love You”, one of my favorite Hitchhiker’s-related novelty songs. Mine, too. I think it's the best of those Stephen Moore singles, at any rate. Like you, my vector was Dr. Demento - I first got it off a tape of a broadcast given to me by a friend in the 90s. everything else I was carrying was lost forever including my Guide and signaling device. I always just put everything in the "thing" from the start, since you know how Infocom is about inventory limits. I will fully admit that my guess was a bit of a cheat, but I'll happily accept the partial win. If I'm being honest, I never knew you could consult the guide about the fruit, so that part of the puzzle was always nonsensical to me and was where I was most betting you'd get stuck. I never realized the unfairness of the whale puzzle, however. I always solved it the same way you did, I just had kept a habit of dropping everything before traveling through Dark, restoring as needed if I needed an item, so I never noticed the item destruction. let me tell you something, the 20th anniversary edition uses flash and a zmachine emulator on a server. Reason I know this, is because Im a collaborator with BlueMaximma Flashpoint, that's a project that is trying to save every flash game and movie before they get lost forever (soon). I was the guy trying to restore the 20th anniversary game, but unfortunately it's semi lost and requires tons of work to make it playable. Does Infocom hold the record for Most Promised Seques That Never Came To Be? I'll link to it in the next post which will cover the final book and manuals. Now that Suspect is over, I can work on that one.